Lopsy, lazy and loveable – that’s Slackajack Elephant! 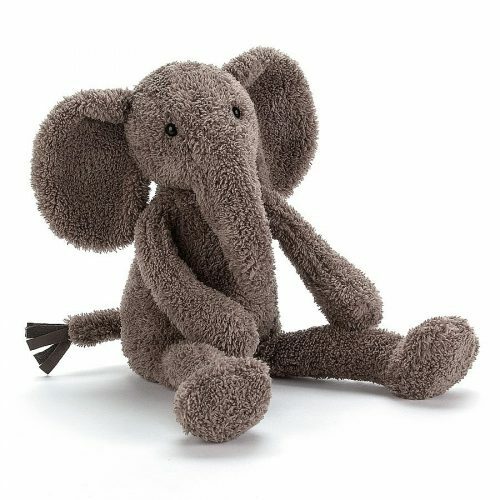 This warm grey elly has the softest fur and long arms and legs for big, floppy hugs. She loves to lope around the town, reading and drawing wherever she sits down. Snuggle and stroke her tassel tail, cuddly trunk and soft, suedey tusks. Tested to and passes the European Safety Standard for toys: EN71 parts 1, 2 & 3, for all ages. Made from 100% polyester. Hand wash only; do not tumble dry, dry clean or iron. Check all labels upon arrival of purchase.